Hello, lovelies! I can't sleep, so I thought I'd post about a recent sample I got from Shray Skincare. 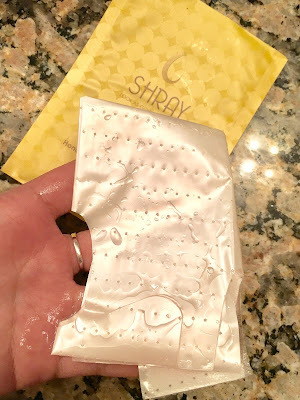 I was recently contacted by Shray Skincare to try one of their sheet masks, and give an honest review. If you are not familiar with the brand, they are a skincare company based in New York, but with the mind set of Taiwanese skincare. In the form of sheet masks. Shray is a up and coming skincare brand founded by Amanda Chen, who is also the CEO. She was in the Taiwanese Military for a decade and afterwards went into Beauty after getting an MBA from Columbia U's Business school, and she has a background in biochemistry. Their philosopy? That "Confidence comes from within and starts with loving your own skin. Shray masks empower women to face life's challenges in the most beautiful way". I like that, empowering women and in the most beautiful way. Why not, right? I like this skincare company already. I really like all their names. On a 400x powered microscope, we examined the skin under three separate conditions: unwashed skin succumbed to daily life, skin washed with water and allowed to air dry, and then water cleansed skin after a SHRAY mask was used. Based on our results, when washing your skin with water, there is a mild hydration effect, meaning a 14% reduction in wrinkles. However, after using a SHRAY mask there is a massive 78% reduction in micro-wrinkles. What does it all mean? Your skin can only absorb a finite amount of hydration when it is applied topically. Using the biotechnology in SHRAY, with our natural gauze mask and micro-sized particles, your skin absorbs 64% more and only in 10 minutes. What mask did I choose? So, after reading all that I was curious, and they had given me an opportunity to try one of their masks. "This is perfect", I thought. I had been breaking out a bit from a new addition to my skincare, and need to calm my skin. If it isn't obvious already, I chose the mask for oily or acne prone skin. I have seen their website and read the what and the why, but I had never seen any of the products. The sample/single - on the website it's called "gift kit"
I was surprised to see that the packaging is quite unique. It opens up like a letter, and into this lovely octogon filled with drawings of Cleopatra. Cleopatra in all four sides. This mask was named after Cleopatra, the first Queen Bee. Sorry, Beyonce. Cleopatra was known for bathing in Goat Milk and Honey to keep her skin young and glowing. No, this doesn't have goat's milk, though I wouldn't if it did. I love how all four sides has a drawing of the Queen, how this packaging it actually quite sturdy, and how it's folded like a gift. It felt like I was opening a gift, at least. Lift up the mask, and you will find a note printed in the middle. Ok, enough of the pretty packaging, and on to the sheet mask. This mask is for people with oily, acne prone skin. I have combination skin, which is leaning towards oily because it is warmer where I live, and I was told that this would be a good match for me. Honey - used for it's antibacterial, & anti-inflammatory properties. It is also filled with antioxidants that are great for anti-aging, and it also moisturizes and soothes the skin. Honey, whether raw or in a sheet mask, gives our skin a natural glow. Centella Asiatica Extract or Gotu Kola (in traditional Chinese medicine)- used for smoothing, and soothing. Great for healing and [blood] circulation problems. Pomegranate Extract - Not one of the star ingredients, but it should be. This is used for it's astringent properties, but pomegranates also have ellagitannins, which are converted into ellagic acid, a phenol that helps strengthen the cell membrane of the skin. Great antioxidant. This mask does not have a lot of ingredients, unlike some sheet masks I have tried. Although it does have one ingredient that is a 7 on the "safety" category of CosDNA. DMDM Hydantoin - This is an antimicrobial, and preservative; a synthetic, formaldehyde-releasing preservative. *If having preservatives, or these kinds of preservative, isn't for you, then you may not like this mask. *please note that I am not telling you that you should like this, nor am I promoting it, I am simply stating that this mask does have DMDM Hydantoin. Not all my sheet masks have this preservative. **If you do not like this mask, then you don't have to buy or use them. It's a matter of preference. PEG-40 Hydrogenated Castor Oil - You see this in many skincare products, especially in sheet masks. This is an emollient, and PEG is an abbreviation for PolyEthylene Glycol mixed with Castor Oil. This is a 3, which is safe to use in cosmetics. As the Shray Skincare website clearly states: This product contains less than *0.25% preservatives. *0.25% total - Shray Skincare uses only 0.1% of both IPBC and DMDM-Hydantoin. Update: Preservatives helps you store your skincare products longer, and without having to keep them in a sterile environments. Products without preservatives must be kept in a sterile environment, and can't be kept in warm places, or shipped out when the weather is warmer. DMDM-Hydantoin, the formaldehyde-releasing preservatives are used to increase a product's shelf life, as well protect it from contamination while you use it and while in storage. Like from dipping your hands in it, steam in the bathroom, These preservatives are released in small amounts over time. It is bad for the skin in high concentrations, but in cosmetics, such as hair care, it is used in very small percentages. The FDA allows below 1% ratio of preservatives, this is considered safe fore use, and that only 0.2% or less can be used in a product. In this one, Queen Bee Mask, the preservatives are a combined total of 0.25% in each mask. **If having preservatives, or these kinds of preservative, isn't for you, then you may not like this mask. **Again, if you do not like this mask, then you don't have to buy or use them. It's a matter of preference. When you first open the pack, the essence looks a bit pink. I was confused at first, but then I remembered that this mask has pomegranate extract. The pink color most likely from that extract. The essence is also very thin and watery. There was enough essence dripping from the mask for me to make a little mess, which is typical of me. It has a plastic covering, or film, to help seperate and unfold the sheet mask. It didn't really help, though. I don't know if you can see in the picture, but when I started to slowly unfold the mask, the plastic part came off already. It's that, or it's because there is a part or cut in the middle with extended "flaps" fora better fit. And let me tell you, the fit was PURRFECT. The brand uses a thin natural wood pulp, which is drenched with essence. The thinner wood pulp is used for better travel of hydration to from the mask to our skin pores. Makes sense. These sheet masks, remind me of the Papa Recipe Bombee Honey Masks, material wise. Only these are not so sheer. I loved this mask. It has a slight honey scent, nothing too strong. I even think the Papa Rceipe Bombee Honey Mask has a stronger scent. The way they made the masks with a slit in the middle from the bottom of the nose septum to the chin, I think is genius. No more ill fitting masks. It was a bit difficult to unfold, though. The plastic came off easily and I had to pull out the flaps, before I had the chance to place it on my face, but I don't mind. The mask was still dripping with essence, and I was able to wear this for about 40 minutes, maybe more. My skin felt soft, soothed and relaxed. The redness from my new little pimple bumps in between my eyes (super awkward place) decreased, too. The sheet mask really did help the essence get absorbed more easily into my skin, because a few minutes after post-masking, my face didn't have a lot of essence left to pat in. Papa Recipe's masks may have a really great rival. Update: I checked the prices, and these are quite pricey. 5 out of 5! I love this mask! I have been looking at the other two masks on the website, and I am thinking of trying the other two, since this one was so great. I know there is concern about the DMDM-Hydantoin, but I don't have or even use anything that has DMDM-Hydantoin everyday. I've been informed that the DMDM-Hydantoin in released in air form when the pack is opened and does not get on the skin. Honestly, this is the first product I know and own that has this preservative. The purpose of this mask was to help my acne, and in those terms, it has done just that. I thought formaldehyde was really bad for you! Or am I thinking of something else? Oh, wait, sorry. Were you thinking about formalin? I just looked it up and formaldehyde is a carcinogen. Short term low dose effect is nasal problems in some people. Long-term high-dose effects are cancer.